Redmi Note 6 Pro Bypass FRP MIUI 10 (Latest 2019), Here we share with you how you can easily Redmi Note 6 Pro FRP Bypass (Latest 2019). 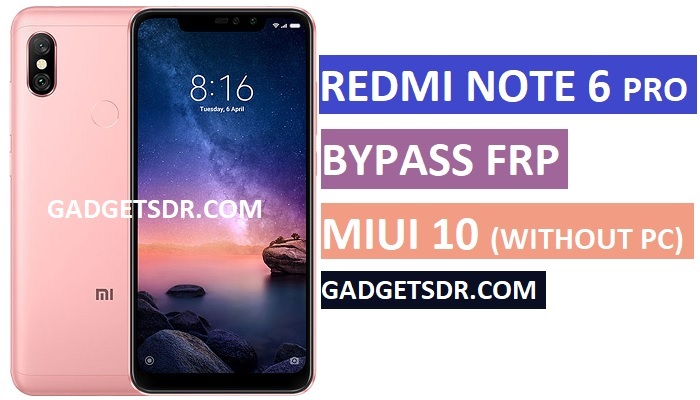 Is your device Stuck on Google Account verification screen then its very annoying so that’s why we share here the latest method to Bypass Google FRP Redmi Note 6 Pro MIUI 10. through this process, you can easily add a new Gmail id and bypass google account verification to access your device again. Before you follow this process only you need a working PC and download some files to Bypass Google FRP Redmi Note 6 Pro. All files and step by step guide on below, Please Download and follow all steps very carefully. -Need a good Wifi Connection. -First of all, from the very first screen “choose Region” from there. -After that, Connect your device to “Wifi Network”. -Once done, then tap on the “Add Network” from the wifi section. -After that, you will get “Share” option there. -Now tap on the “Share” option and then a popup will open just long tap on “Gmail” option from that popup. -Then we will redirect to “Gmail application” settings page. -After that, tap on the “notification” option there, then select the “App Settings” tap from there. -Once done, then you can see “3” dots from the top right corner tap on that and select the “help & feedback” option from there. -Then type “Voice” and select “Get started with Voice Access” there. -Then go down, and you will get a Youtube Video there. -Now tap on the clock icon to Bypass Google FRP Redmi Note 6 Pro Miui 10. -Now it will redirect to the browser selection popup screen. -Then tap on the MI Browser and then tap “Agree”. -After that, now click on the”google search bar” and download some frp tools that help to Redmi Note 6 Pro FRP Bypass Miui 10. -Now type on the Google search bar “Bypass frp gadgetsdr“. Note:- following this process you need only one apk to Bypass Google FRP Redmi Note 6 Pro MIUI 10. -Now download from there Redmi 5A FRP Bypass Tools. -Download from there “Apex Launcher.apk”. -Once downloaded, tap on the “3 arrows” from the form below left corner of your mi browser then select “downloads” from there. -After that, install the “Apex Launcher” from there. -Then install apex launcher.apk, by tapping install and “open”. -Congrats, Now you can access home screen of your device but still frp lock is enabled so now follow the final steps to Redmi Note 6 Pro FRP Bypass. -Once you can access your device home screen. -Then go back to the Settings main menu and then tap on “Additional Setting” from there. Make sure: recheck more than two times when you trying to enable “OEM Unlocking” option. -Then go down and enable the “USB Debugging” option also. -Done, Now restart your device and set your device. -Now you have successfully followed the process to Redmi Note 6 Pro FRP Bypass MIUI 10. Thanks for visiting us, Comment below if you face any problem With Bypass Google FRP Redmi Note 6 Pro MIUI 10, we will try to solve your problem as soon as possible. you can check other some tutorial here to help you.